The boss of British Gas has defended the energy industry in the face of public anger at rising prices. In an exclusive interview with MoneySavingExpert.com, managing director Phil Bentley (right) insists firms are simply responding to rising costs and cannot sell gas and electricity at a loss. So far, only Scottish Power has announced price rises for this summer, though the rest of the Big Six are expected to follow, blaming rising wholesale costs, the price energy firms pay for power. They all hiked costs last winter. Bentley refused to confirm if British Gas will raise prices when asked directly, but he hinted elsewhere in the interview that a jump is inevitable. The rises would add to the pain for households, already punished by soaring inflation. Scottish Power plans to raise prices by up to 19% in August. A report earlier this month stated sky-high energy prices are already forcing the poorest pensioners to cut back on their food spending. Bentley also explained how exactly energy bills are made up to help customers understand firms' costs. He also gave his view on the future of the market, which includes the prediction the UK may have even fewer players as he expects one or two firms to pull out due to the risky nature of the energy business. We put a number of key concerns (in bold) about energy prices to Bentley. See his responses (in normal font) below. Are the expected energy price rises fair? The reality is that the price of energy is going up and I would like to say we can consume without consequence, but we can't. When prices were going up – wholesale prices tripled in 2008 – we lagged behind [didn't raise prices by as much]. The same happened last year. In the third quarter of last year we were losing money so we had to put prices up. We are in the same situation this year – we are already lagging. Wholesale prices are up 25% to 30%. There is big demand and more taxes which is pushing the price of gas up, while oil prices are also up. So the underlying commodity has gone up in price since the beginning of the year so retail prices have to go up at least 15%. Why did Scottish Power put them up by 19%? I can rationalise that. Some people are having to cut back on food because energy bills are so high. What do you have to say to them? With energy efficiency, the right government support and decent housing stock no-one should have to make that choice. There are billions of pounds in unclaimed benefits and we have got to get the housing stock in the private rental sector right. We have some of the most energy inefficient housing in Europe, like post-war council blocks made of concrete slabs. We also have the highest number of Victorian homes. The Government can do more. Take the winter fuel payment [which gives £250 or £400 a year for those over 60]. We think that should be targeted on low incomes. The Department for Work and Pensions has got all the data that says which individuals are getting which support. They should target the winter fuel payment and give that money to them and not to those who don't need it. Also, it is given just before Christmas so it goes on presents. It should go to the energy firms and we'll take that money off the bill. We think we can get gas and electricity down to a typical £450 a year for those who require support through social tariffs, energy efficiency and winter fuel. We often hear that energy firms pass on rises in wholesale costs more readily than they drop prices when wholesale costs are falling. Why is this? It's not as simple as saying retail prices are pegged to wholesale prices. 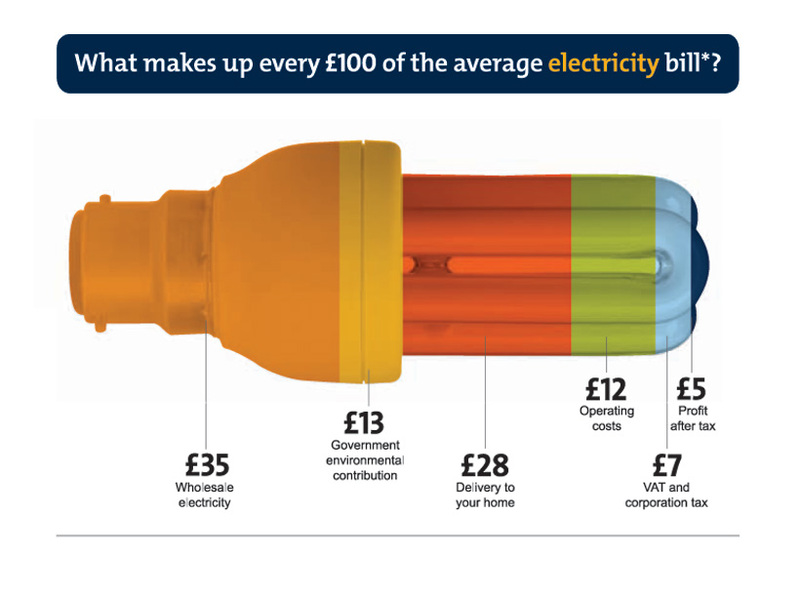 On a £100 gas bill, the wholesale price that we pay makes up about £55 of this, so there is so much more cost to getting the commodity into your home. There is transport and distribution down the pipes and through the networks into your home. Those have been going up materially and make up about 20% of the bill. Then we have green costs which are our obligations to make homes more energy efficient. There are also customer service costs and tax. We are left with about £5 of profit. The wholesale price is the most volatile of all those but the other elements are all going up, we know that. The bit we can't always predict is the wholesale price. Sometimes you will see a chart and it shows wholesale prices fell 30% and people complain because prices only fell by 10%. At that point, transportation and green costs would have gone up more. It does not work dollar for dollar. 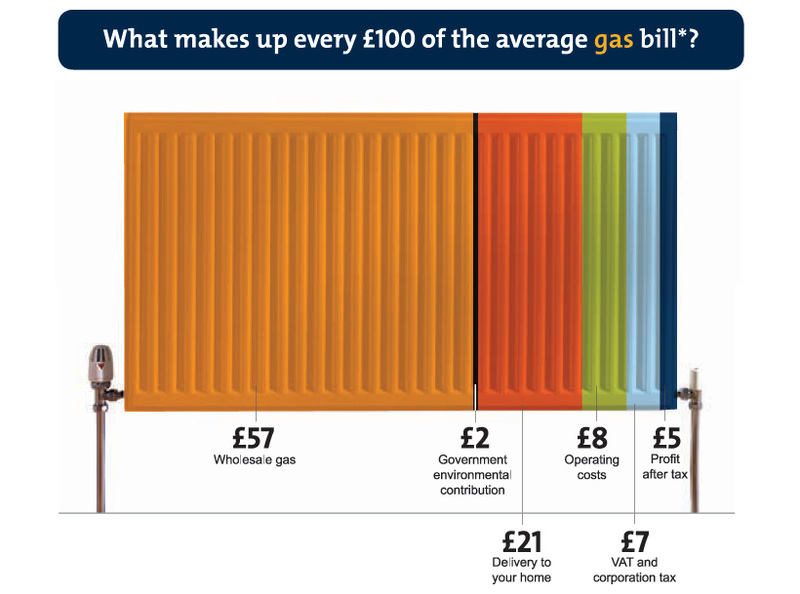 British Gas supplied us with an illustration of what costs go into a £100 bill. Click on the gas bill or electricity bill examples to find out. When one energy firm hikes prices, the others tend to follow. Are you all acting in tandem? We never have any conversations with anyone else because of competition law. When it rains people all put umbrellas up but it doesn't mean they are all acting in cahoots. We all have the same cost structures. No-one ever wants to go first and we have never risen first. But we have always been the first to lower prices. If all firms face the same cost structure, why do some firms increase prices more than others? There is a difference in how we buy that commodity. You are always buying forward [where firms pay now for energy they will supply to us in future] because you want to know you have that power guaranteed. The last thing you want to is is look around with a week to go as you have to buy from the spot market which is more expensive. Some companies may buy forward for one year, some for two. Companies move at a different pace if they buy over a different period which can affect their costs. So what are British Gas's plans on price rises? We watch the market and see what is needed. We don't comment on what, who and when but as a point of principle, we won't sell at a loss. Because energy is a necessity, not a luxury, isn't there a duty on firms to use profits from elsewhere in their business to keep household bills down? Profits for the industry are 3% to 5% of a bill, if that. If you built a £1 billion wind farm and sell it as a loss we would not build in the first place. If selling at a loss we would no longer supply energy. It's been said that there is not enough competition in the energy market which is keeping prices high. Do you agree? We have the lowest unit prices in Europe. That is because we have a competitive market that drives out inefficiency compared to Continental Europe. We have so many different tariffs. No other country has this variety of choice. There is three times the switching on energy as in banking. Switching rates in energy are second only to motor insurance. Do you expect there to be any major new entrants to the energy market? Are six big companies enough? Yes. But it is an un attractive market to enter. It is risky. When prices are falling, new entrants will undercut British Gas but when they start to rise the smaller companies will suffer. It is not because the market is a stitch up. It is because of lower profits and high volatility. In fact, I think companies will pull out. We will eventually have four or five. Some, including the regulator Ofgem, say the market is too complicated, such as the fact there is a two-tier pricing system, whereby you pay more for the first set of units you use, plus there are different charges for different regions. Pricing is complicated in tiers. But even if you used no energy it costs companies to have you as a customer so there are fixed costs, which is the standing charge. The industry said we will embrace the standing charge in tier one pricing, but then the price drops. In every region you have different distribution charges so we have all this complexity. For us there are about 1,000 different price points a customer can have. So if prices are going up, what can people do to cut their bills? We have done analysis where average consumption is falling by 22% due to people making their homes more energy efficient. That is the average. Many people have done a lot to make their home more energy efficient so people who have done a lot are saving 40% plus. Unit prices are going up and everyone needs to get their head round it. It doesn't mean bills need to go up if people are more energy efficient, such as fitting insulation. What is your view on long-term energy prices? We have a good feel for transport, distribution and green costs. They will probably add 20%-25% to bills over the next five years. So then the question is how much more or less will the commodity add, but it is volatile. What is your view on doorstep selling? It is often criticised as consumers are misled and Scottish & Southern Energy (SSE) was recently found guilty of mis-selling. We have said to Ofgem it must tighten rules on doorstep selling. If it doesn't get its act together we may even stop it because of the reputation impact of mis-selling. It was disappointing to see how SSE scripted its sales. We like to think we set the standard. We have lost sales because when someone genuinely cannot save money by switching to us we don't go through with it.